This entry was posted on Friday, November 18th, 2011 at 12:40 pm and is filed under Computing. You can follow any responses to this entry through the RSS 2.0 feed. You can leave a response, or trackback from your own site. Thanks for this, we just have a question about enhancing it. Is it possible to enter two leave codes into one day? Hi Tom, it would be possible, but you’d need a more sophisticated formula to count the cells. The formula would need to search for a substring in the cell instead of doing a direct match. Excellent work, Thank you for making this free and sharing your skills. 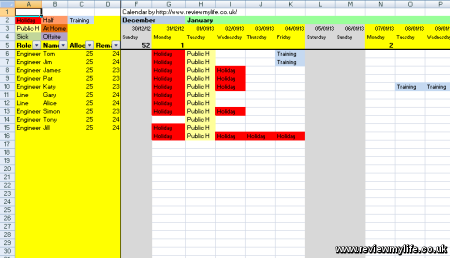 Hi there, this is brilliant but for some reason the spreadsheet no longer updates leave days. I am using Office 2007 and when I use format painter to update cells it does not automatically update leave days left. Is there a reason why this might happen? Hi Leon, if it was working before and then it stopped, then you have probably broken the formulas. You could re-download the original spreadsheet and compare the formulas with your version to see if you can fix it. Also I experience a problem – when I save as .xls (using Open Office) I get the following error message: “The Document contains more rows than supported in the selected format – Additional Rows could not be saved” Anyone experience the same? Hi Gregory, XLS is a very limited format. I’d suggest saving in the more modern ODS if you are using OpenOffice. For anyone using a more modern Excel you can simply save it in its original file format. Hi thanks for the calendars they work very well is there any chance you can upload a 2014 calendar please trying to plan ahead. i love your holiday planner and have used it for the last 2 years. Did you create one for 2014 yet? Absolutely brilliant and perfect in every way. Looks great, easy to use and has made planning a breeze. Will there be a 2014 and so on. Hi, love your spreadsheet. Any chance of a 2014 version? have found the 2013 cal to be excellent for our office. will you have a 2014 version? Please, please,please could we have a 2014 version. Have been using this template since 2012 – fantastic! Hi have you been able to sort out a 2014 version yet please?